At the pinnacle of the Mount of Olives, you'll enjoy a terrific view of the Temple Mount from inside the Dominus Flevit Chapel. I love go there when I take tour groups to Israel because of the fact that it has so much significance in the history of Jesus Christ. When Jesus would come to Jerusalem, He would always stay in the little town of Bethany on the other side of the mountain. Then Jesus would walk over and probably stop somewhere around the Mount of Olives in the morning and pray, looking over the city and the Temple, and then He'd go on down to the Temple Mount. During the last week of Jesus' life, when He made his Triumphal Entry into Jerusalem, He rode into town on a donkey. He was hailed "Hosanna, the Son of David." But, that same crowd was yelling for His crucifixion a week later. The Bible tells us repeatedly that Jesus is going to return, and that His return is going to be very different from His first coming. Let's contrast the two advents of Jesus Christ for a moment. The first time Jesus came, He came humbly on a donkey. But, He is going to return on a white war charger, which is the symbol of a victorious general. The first time Jesus came, He came humbly to walk to a cross and die for the sins of mankind, but He is coming back to pour out the wrath of God upon those who have rejected the grace, mercy and love of God. The first time Jesus came, He came with eyes filled with tears. He wept at the tomb of Lazarus. He wept over the city of Jerusalem. But, it says when He returns His eyes will be like white hot coals of fire, because He is coming in judgment. The first time Jesus came, He was given one crown — a crown of thorns which was pressed down upon His head until the blood ran down upon His shoulders. But, when Jesus returns, He's going to come back with all the crowns of all the kingdoms of the world. Every time I bring a group up to the Mount of Olives, I give them that teaching and talk about how the second time Jesus comes He is going to ride down into the Kidron Valley and then He is going to ride up to the Eastern Gate. It's then going to blow open supernaturally as we are told in Psalm 24. 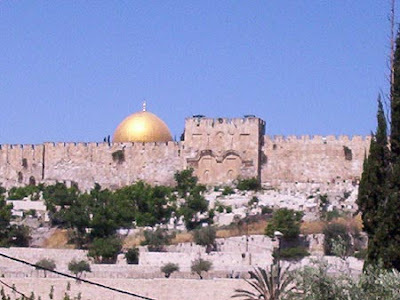 Jesus is going to go up on the Temple Mount and He is going to be coroneted the King of Kings and the Lord of Lords! Back in about 1987, I brought a good sized group over to the Holy Land, not only to give them a tour of the land, but I brought them over to attend the International Celebration of the Feast of Tabernacles. About 4,000 to 5,000 Christians a year attend. I brought that group up to Dominus Flevit and I presented the teaching that I just covered in a more extended form. During the evening, we got ready for the final evening of the celebration, joining some 4,000 to 5,000 Christians walking around the Old City of Jerusalem. Bands were playing, we were singing and waving banners, and we were waving the flags of our country. We walked around the city to illustrate to the Jewish people that there are Christians in the world who stand behind Israel. We ended that march around the city by walking up the very steep Mount of Olives. When we got to the top, we stood there and watched the sunset over the city. Thousands of pilgrims sang hymns as the sun set. It was a very moving time. One of the persons that we had in our group was a man by the name of Terry Gibson. Terry was a trustee of Lamb & Lion Ministries at the time. He's a pastor from the Houston, Texas area. When he got back to his room that night, Terry was so moved by what he had experienced at Dominus Flevit and in that march around that city and in that sunset that he experienced over the city of Jerusalem, that he sat down and began to write. He wrote a poem about the Eastern Gate. That poem has since been published in several books. The following is what he wrote. "Save us Son of David"
Pierced hands — what agony! It was the coming of the King! They sang "Hosanna to the Son of David"
When the Lord of Hosts shall come? He will wipe all the tears away. Wasn't that a powerful poem? I have read that many times to our pilgrimage groups, and each time it just blesses my soul. In the third segment of our study of the Gate to Prophecy, we'll look at why the Eastern Gate is embroiled in a great archaeological debate. Praise God! Hallelujah! Great Post. Thank you! MARANATHA! Hallalujab to the Lamb who has conquered to reign !!!! thanks for the post... great blessing !! !